Home > Local Business > Per Capita Davis: What can valley gardeners expect as climate changes? Per Capita Davis: What can valley gardeners expect as climate changes? Three weather phenomena will mark the progress of climate change in our area. First, the West Coast ridge, stubbornly persistent during recent winters, blocking storms and leading to endless sunny days. It was a big factor this winter. Second, loss of tule fog and valley fog. According to a study published in 2014, winter fog in the valley decreased 46 percent over a 32-year period. Third, increased intensity of the July “heat domes” that build over the Southwest, centered on the Four Corners region, which lead to extreme heat waves. These self-reinforcing high-pressure ridges expand outward, over the valley and even, at times, the Bay Area (as it did last summer). The impact of climate change here will be felt soonest on our tree crops and summer vegetables. Twenty years ago, I planted a Harcot apricot. Production was very good for about a decade. Then I had a couple of years when the tree failed to bloom. The buds were there, but just wouldn’t open right. In the last several years, flower buds have completely failed to open and growth has been sparse early in the season. I haven’t had a fruit on this tree for nearly a decade. It is about to provide one last crop for me: firewood. A tree that gets insufficient “chilling portions,” due to spikes of high temperatures mid-winter, will come out of dormancy irregularly. Many blossoms fail to open. Pollen tubes don’t develop. Fruit fails to set or sets erratically over a longer period. Ripening is affected, and fruit quality diminishes. A symptom that confirms this diagnosis is “delayed foliation” — leaves emerge on different branches at varying rates. This can happen even to varieties formerly tested and considered to receive sufficient chilling hours in the valley. Spikes of higher temperatures mid-winter “undo” the dormancy cycle. On average, we can expect an increasing number of fruit types to have reduced fruit set some, then many, years as time goes by. My Harcot apricot is an early signal of the impact of climate change locally. So far, most varieties have not been affected. But this can have significant agricultural implications over time, as well as affecting backyard gardens. Cherries were affected in 2014, with yield statewide off by half due to high temperatures in January. Cherries will likely be a thing of the past in the Sacramento Valley decades from now. Also of particular concern commercially would be such familiar varieties as Redhaven peach and Chandler walnut and crops such as pistachio nuts. We can also expect hotter summers to affect our vegetable gardens. Summer heat waves in the valley happen when a large dome of high pressure forms over the American Southwest. These huge air masses spread outward as heat rises, expands out and settles out at the edges. Eventually the Great Basin and Central California are encompassed, and in the hottest episodes the warm, stagnant air settles over us and even over the Bay Area. Typically, these last a few days, and then the Delta breeze pushes back in as the ridge weakens and moves on east. Until then, very high temperatures and unhealthy air prevail. Our favorite fruit from the vegetable garden, the tomato, is affected by heat in two ways. First, during extreme heat, exposed fruit scorches. It literally sunburns. Peppers and eggplant are also vulnerable. Tomatoes also will not set fruit above about 90 degrees. Pollination fails and the flowers drop off. That happens about half the time here from mid-June through mid-August, meaning fruit can set during the other half when daytime highs are in the 80s. Summer 2017 showed us what is in store. We had a couple of major heat waves, and the entire month of July was above average. Actual daytime highs suitable for fruit set on tomatoes only occurred about a third of the time. Many gardeners had reduced yields and most harvest was delayed until October. One big challenge for gardeners is that change will not be linear. Last year was hotter than average, but this year might be milder. Climate is the average weather over time. It is likely that there will be more heat waves, they will be hotter and last longer and yields will be down those years. Most winters will have sufficient chilling, but an increasing number will not. Another impact will be expansion of pests into the region due to milder winters, and more generation cycles of existing pests. Examples include codling moth, redhumped caterpillar, and citrus leafminer, all of which already have multiple generations each summer. All in all, climate change means Davis gardeners of the future will likely have fewer varieties to choose from, will have to take special steps to get good yields of summer vegetables, may have more pests and diseases to contend with and will certainly have to water more carefully. — Please send questions, comments, or requests for more information about this column to donshor@gmail.com. Per Capita Davis appears the first and third Wednesday of each month. * Editor’s note: This is the second of two guest columns from local experts on birds and plants. Don Shor is an authority on plants and owner of the Redwood Barn Nursery. 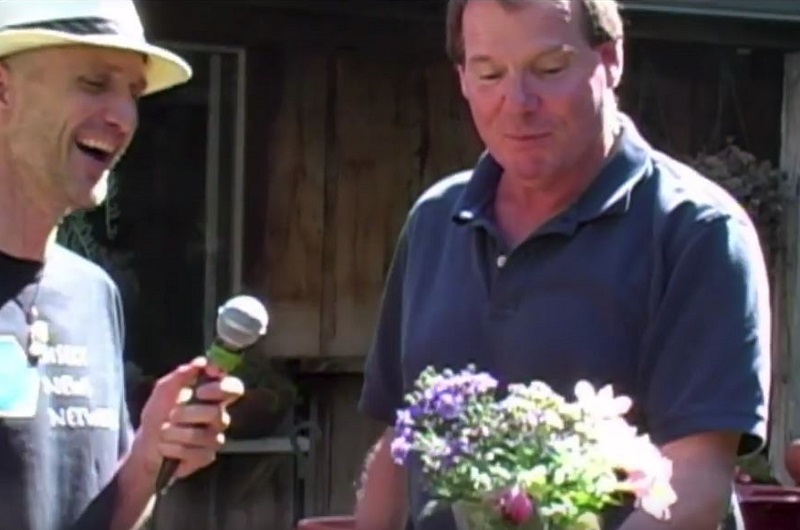 Don Shor of the Redwood Barn Nursery appears on a video segment produced by The Insect Network with interviewer Emmet Brady at Davis Media Access. Courtesy photo from video capture.